Aloo Gobi Masala is a famous North Indian dish that goes well with rotis, parathas and rice varieties. 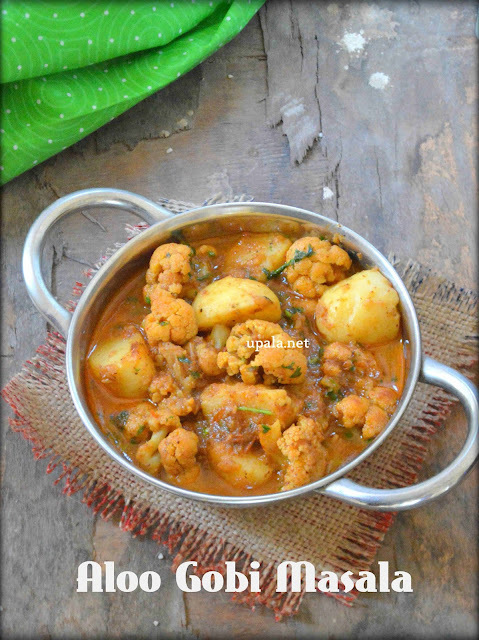 This Aloo gobi masala is simply irresistible, also I have made this gravy more delicious and katta meetta type by adding few cashews and raisins. We really loved the cashews and raisins coming in mouth while eating, giving it a unique taste and texture. 1) Wash and clean the Cauliflower florets. Boil water and add salt, drop the florets in the hot water and leave it for few minutes. 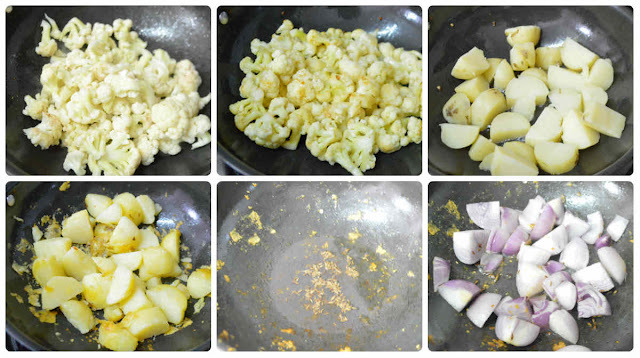 Drain water from cauliflower and set aside. 2) Pressure cook potatoes and after it cools, peel the skin and chop them as big cubes. 3) Heat 2 tbsp oil in a kadai and add cashews to fry till light brown. Next add raisins and fry till they puff up. Transfer them to a bowl. 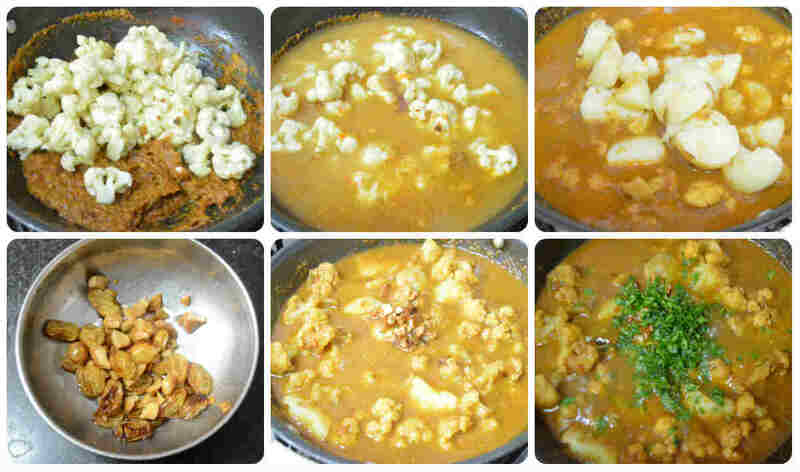 4) Add 2 tbsp oil and drop the cauliflower florets in the kadai, fry them till they turn light brown and transfer them to a bowl. 5) Add some 2 tbsp oil and add the chopped potatoes to the kadai to fry. After they turn little crispy with light brown color then remove them from kadai and set aside. 6) Add 2 tbsp of oil to kadai and add cumin seeds to crackle. 7) Next add onions and fry till light brown. 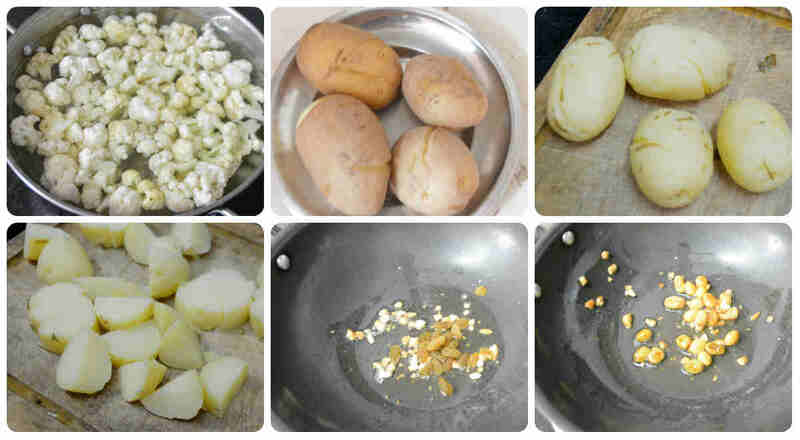 8) Now add Ginger and garlic, fry them for few more minutes. 9) Add tomatoes, fry them till they gets cooked and turn mushy. 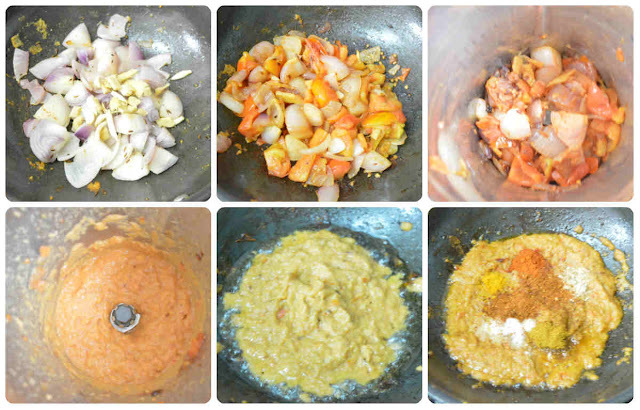 10) After this onion tomato mixture gets cooked transfer them to a mixer and grind to smooth paste. 11) Heat 2 tbsp oil in the same kadai, transfer the onion tomato paste and fry for few minutes. 12) Add all spice powders, salt, sugar and mix well. 13) Now drop the cauliflower florets and add 2 cups of water. Close it with a lid and leave them to cook in the gravy. 14) After cauliflower florets are cooked, add potatoes and mix well. Leave them to boil for few more minutes. 15) Next add cashews, raisins and mix well. 16) Finally garnish with coriander leaves and mix well. 1) Instead of normal potatoes, you can use baby potatoes too. 2) You can add few fresh cream at final stage to give a nice flavor and taste to gravy.